Axolotls are carnivores, and insects make up the bulk of their diet in the wild. In the aquarium, they will accept a range of live, frozen and dried foods. Here are a list of recommended staples and treats. Scroll down for more info on each of these! I have tried a lot of the “axolotl pellets” on the market and I have to tell you, my critters were none too pleased. My personal recommendation is Northfin Jumbo Fish, which is a soft sinking pellet for carnivore fish. The reason I like it is that it has quality ingredients, is reasonably-priced, and I’ve never encountered an axolotl who didn’t like them. 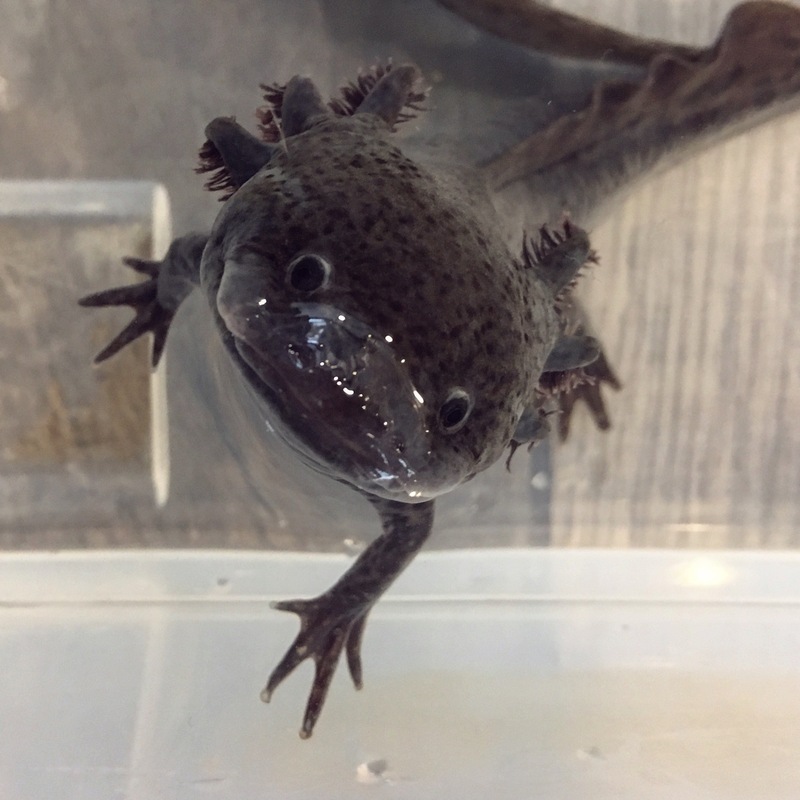 If you want to try a different pellet, make sure it’s the sinking type, as axolotls have difficulty learning to look for their food at the water surface. Choose a pellet with a protein content around 40%, and which don’t list grains within the first three ingredients. It should be supplemented with vitamins and minerals, and the pellet should soften quickly without losing its shape or making the water cloudy. Regardless of the brand you decide to go with, it’s a good idea to supplement your axolotl’s diet with the occasional live worm. Looking to transition your axolotl from live/frozen foods to pellets? This FAQ entry is for you! Axolotls love their nightcrawlers! I consider them a form as enrichment as well as a healthy, affordable food staple. Most axolotls will enthusiastically lunge at them as soon as they see them. Where to find them: Nightcrawlers are the large Canadian earthworms sold as fishing bait throughout the country. If you want to use the ones you find in your backyard, make sure your neighbors aren’t using any herbicides or pesticides, as those could be toxic to your axolotl. If you’re in the area, you’re welcome to come by my shop to pick some up. I can also ship them when the weather permits. If you’d like to order some and they’re not listed in my shop, email me and I’ll see what I can do for you. How to store them: Nightcrawlers need to be stored in a cool place, such as a basement or a wine cooler. If you transfer them to a plastic container with fresh soil and a couple of small ventilation holes, they will keep for several months. There is no need to feed them — just lightly mist the soil with water if it looks dry. If all of the worms are at the surface when you open the container, it’s a sign that they are either too hot or the soil is due to be changed. How to feed them to your axolotl: I recommend using tongs, and swishing them in a bit of water first to dislodge any dirt and excess slime. You might want to cut the really big ones in half, too. How much to feed: One nightcrawler every other day is enough. Alternatively, you could do half a nightcrawler every day. Red wigglers are compost worms, which means you can start your own culture at home if you have the patience for it. There’s a lot of trial and error involved, as certain foods cause them to develop a bitter taste which axolotls are quite fussy about. Where to find them: Most of the big stores that sell camping and fishing supplies carry them as fish bait. You can also order them online through most of the year. I frequently have some in stock, as well. If they’re not listed in my shop, email me and I can probably order some in for you. How to store them: These do well at room temperature. Make sure there’s some ventilation in their container. If you’d like to start your own culture, you’ll find plenty of vermicomposting guides online. Personally, I haven’t developed the knack for it, yet. How to feed them to your axolotl: These survive longer than nightcrawlers in water, so you can just drop them in and wait for your axolotl to find them. I still prefer to use tongs, personally — it prevents the worms from sneaking under the decor, and makes it easier for the axolotl to grab. I also recommend swishing them in a bit of water first to dislodge any dirt and excess slime. Some axolotls are fussy about that. How much to feed: It depends on the size, but I find that one per day is usually enough. Alternatively, you could do two every other day. Problems with fussy eaters? Chances are your red wigglers taste bitter. Try a different kind of food, and if your axolotl accepts that one, take it as a sign that you need to modify your red wigglers’ diet. What the heck is Grub Pie? Where to find it: You can buy it from some online shops. I frequently have it in stock. How to store it: The gel keeps for up to two weeks in the fridge. How to feed it to your axolotl: Axolotls like to gobble up their food in one bite, so you should start by cutting the gel into appropriate-sized pieces. I highly recommend using tongs to feed these to your axolotl — in my experience, axolotls don’t like to pick these up from the bottom of the tank. If they stay in the water for too long, the pieces start to fall apart and the water turns quite nasty. How much to feed: Most adults will eat a piece that is roughly the size of half a gummy worm every day, or one whole gummy worm every other day. Juveniles who are still growing and females who are plump with eggs may want to eat a little extra. Everyone loves bloodworms! They are the french fries of the aquatic world. They make a great treat, and are useful when trying to convince a sick or stressed axolotl to eat. They are high in fat and low in protein, so they should not be fed as a staple. Where to find them: Your local fish store most likely carries them. How to store them: Stick them in the freezer, and break off a little piece whenever you need it. They will thaw very quickly in the aquarium. How much to feed: If you buy bloodworms in small amounts, chances are it will be pre-partitioned. If not, try to break off a piece that’s no larger than a quarter. Remember, it’s only meant to be a treat! “Feeder” fish sold at pet stores are best avoided, as they may harbor parasites or other pathogens. Fish that you breed yourself can be a healthy food source, so long as they are small enough that the bones won’t cause a blockage. Even so, I wouldn’t recommend feeding live fish as a staple. Axolotls are just not very good at catching them. Their natural hunting method is to dig through the mud with their noses to find bugs and invertebrates, or to camouflage themselves among plants and wait for prey to venture near their mouths. Trying to ambush fish this way can be a fun game for them, but you can easily see how they would starve if they had no other meal option! If you do want to try raising fish to feed your axolotls, make sure you select a compatible species. You can find my recommendations here: Axolotl tankmates: fish edition.